The arrest of the internationally-blacklisted fishing vessel ‘Labiko 2’ by the Liberian Coast Guard, assisted by Sea Shepherd, gives insight into the shadowy and largely unregulated shark liver oil industry. After being kicked out of European waters, these unscrupulous owners and operators, mostly based out of Spain, have set their sights on West Africa. The activity of this fishing fleet, mostly based in Spain, was poorly documented, with little information provided to fisheries management on catch and by-catch. The discard of fishing nets at sea, both through unintentional loss as well as deliberate dumping, was common practice. Approximately 30 kilometers of gillnet was lost per vessel per 4-8 week fishing trip. These lost nets -- also called ‘ghost nets’ -- can go on killing anything it “catches” for many years; they also equated to 750 tons of plastic pollution discarded at sea every month. “The owners and operators of the Labiko 2 conspired to circumvent the laws of Liberia, devastating the Liberian marine environment in the process. I’ve said it before, and I’ll say it again - the Republic of Liberia is not open for business to plunderers”, said the Honorable Brownie Samukai, Liberian Minister of National Defense. On board the Labiko 2 was a shark liver oil production facility. From documents inspected onboard, previous fishing trips had yielded 40, 52 and 60 metric tons of shark liver oil. Forty metric tons of shark liver oil corresponds to approximately 53,000 dead sharks. An average fishing trip for the Labiko 2 was between 15-18 fishing days, meaning that the Labiko 2 was conservatively killing over 500,000 sharks per year. FUJI1164: Liberian Coast Guard sailor inspects shark liver production facility. Photo by Melissa Romao/Sea Shepherd. FUJI1189: The Liberian Coast Guard inspects the Labiko 2. Photo by Melissa Romao/Sea Shepherd. FUJI0091: Endangered hammerhead sharks with their fins removed on board the Labiko 2. Photo by Melissa Romao/Sea Shepherd. FUJI1149: Sea Shepherd assists the Liberian Coast Guard to board the Labiko 2. Photo by Melissa Romao/Sea Shepherd. 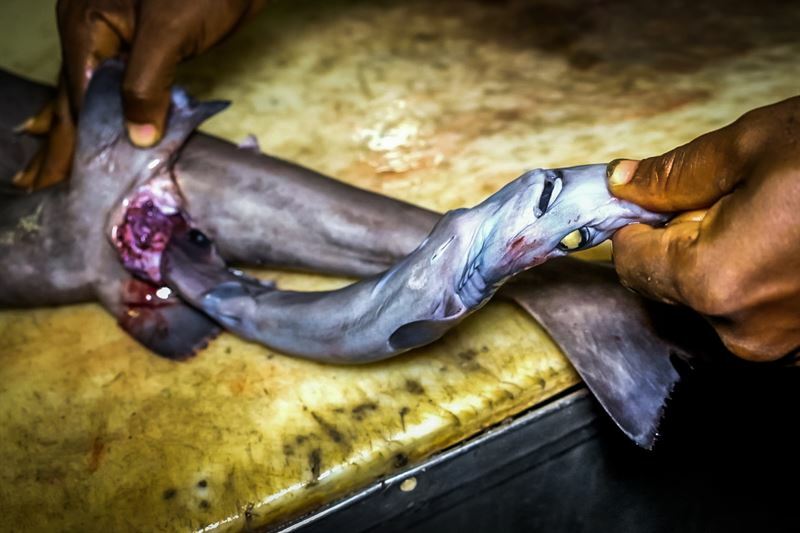 FUJI1605: On board the Labiko 2, sharks are finned before their livers are processed into oil. Photo by Melissa Romao/Sea Shepherd. FUJI0137: Sea Shepherd assists the Liberian Coast Guard to board the Labiko 2 as heavy rain falls. Photo by Melissa Romao/Sea Shepherd. FUJI0187: Deep-water sharks before livers are removed. Photo by Melissa Romao/Sea Shepherd. FUJI1716: Shark fetus removed from finned deep-water shark. Photo by Melissa Romao/Sea Shepherd. DSC02605: Deep-water sharks killed for their fins and liver. Photo by Jake Parker/Sea Shepherd. DJI_0063: Sea Shepherd assists the Liberian Coast guard to arrest the Labiko 2. Photo by Melissa Romao/Sea Shepherd.